It’s been sometime time since Microsoft acquired Nokia’s smartphone section. The first device unveiled by Microsoft after the historic acquisition is the Microsoft Lumia 535. There was a confusion regarding what brand will be given to the low budget feature phones but the feature phones are reported to sell with the Nokia brand. 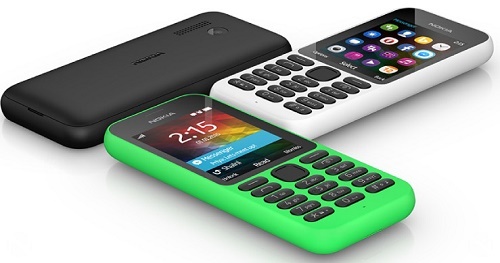 Today a new phone has been announced, known as the Nokia 215 which is claimed to be the “most affordable Internet-ready entry-level phone yet”. The most promising and unique feature that will be offered by Nokia 215 is the powerful battery of 1100 mAh. The phone, as the company says, will retain charge for about 29 days. We have always seen that unlike smartphones, feature phones generally have strong battery. But this phone claims something surprising. Besides a humongous battery life, the device will have 2.4-inch QVGA (320x240px) display with glance screen support, microSD support expandable upto 32 GB, 8 MB phone memory, MP3 player and FM radio. Two variants will be available, a single IM variant and another one with dual SIM support. The single SIm model will retain charge upto 29 days whereas the dual SIm model can remain without charge for 21 days.